Love is the greatest of all feelings and emotions but words don�t come easy to express your love for someone. There are various ways to express your love for someone but nothing works better than I love you cards. Love greetings feature a romantic message on a folded card in the most special way. Love greeting cards communicate your affection and feelings just the way you want. And, what can be an even special way to say �I love you� than design personalized I love you cards yourself. 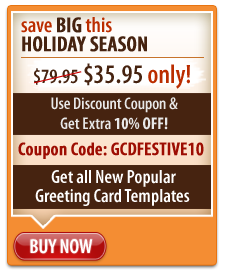 Don�t get surprised, you can do easily with the help of greeting card studio software. The greeting design software allows you to create a card of your choice and insert custom images, clip arts and messages for your loved ones. If you don�t want to opt traditional printed foldable cards, you can design love e cards which can be shared on Picasa, Facebook and flicker or sent via email. Convey the right message in the right way. Think and write from the bottom of your heart. Add songs, poems or rhymes of your choice to your love cards. Try different templates and choose the one that best suits your personality type. Insert photographs to make the romantic greeting cards even more lovable. So get your copy of greeting card designing software now and create the most beautiful love greeting cards in an artistic style and make them memorable forever.